Highland Express is an approved ground transportation system for the Defense Travel Management Office (DTMO), a noteworthy accomplishment in today’s competitive world of transportation. Highland Express Shuttle Service, of Raleigh, North Carolina, was incorporated in March of 1984 as an airport shuttle between Fayetteville and Raleigh, North Carolina. That same year, the Navy Recruiting services inquired about transporting their applicants to the Raleigh MEPS from the Fayetteville Recruiting Station on the airport shuttle. The service was initiated and the first door-to-door applicant travel route in the United States was conceived. Over the next nine years Highland expanded to 8 routes in the southeastern United States. In January of 1993, Highland hired a new general manager, Retired Major Steven Shelton, with 5 years of Recruiting Company Commander and Battalion Executive Officer experience. He is currently the Owner and CEO of Highland. Realizing the importance of more “phone time” and less “windshield time” for the field recruiter, Major Shelton devoted his time to developing a safe and timely system of transporting applicants to and from the MEPS for testing and processing. The Recruiting Services using the shuttle cut their GSA mileage by almost 50%, reducing their fuel consumption expense, reducing their vehicle accident rate significantly, eliminated recruiter congestion within the MEPS, gave recruiters time with their families on weekends, and most of all, assisted the Recruiters with their “MISSION ACCOMPLISHMENT”. Highland’s reputation began to spread. Also, in October of 1993, Highland contracted with TRANSCOR, INC (formerly GTS, Ground Transportation Services), to become its ticketing agent. TRANSCOR eliminated Highland’s antiquated, labor and cost intensive ticketing system with a modernized system which was their specialty. TRANSCOR’s dependable relations with the military for numerous years in providing airline and bus transportation for the Recruiting Services made TRANSCOR the ideal company to market Highland’s transportation services. Thus, the “Team” was formed and Highland’s motto became “SETTING THE STANDARD” for passenger transportation. Over the years, Highland has become a nationwide company providing “Daily Service” to 40 states, over 500 Recruiting Stations, numerous MEPS transportation requirements, Basic Training Routes, and Veteran related transportation. Highland is 100% Veteran owned. The Senior Management Staff at Highland is comprised of all Retired Military and Veterans. The President/General Manager is retired military with 5 years experience as the Raleigh MEPS Operations NCO. The Vice President of Operations is a Navy Veteran. The Vice President of Administration is an Army Veteran. The Nationwide Operations Manager is Coast Guard Veteran. Highland’s workforce of 350 personnel is 60% Retired Military or Veterans. With 300 + vehicles, Highland travels over 15,000,000 miles per year for the Recruiting Services, maintaining a Federal DOT Out of Service and Accident Rating of 0 (best rating), and a Defense Travel Management Office Safety Inspection Rating of 1 (highest attainable). We are proud of our performance. Since its inception in 1984, Highland has never gone out of business or changed its name to cover indiscretions with the military. In fact, Highland has always been available for special needs. In 1996, the carrier performing applicant travel for Alabama, Georgia, and Tennessee, went out of business. The recruiting services contacted Highland for replacement service, and all routes were established within two weeks. In 1998, Highland came to the aid of the Beckley MEPS and the Army Recruiting Battalion when snow collapsed the roof of their building, preventing operations. For eight months, two routes were established and operated to transport applicants to and from the Richmond VA MEPS for processing, with no increase in fare. In 2001, Highland purchased ten vehicles to assist the MEPS, through DTMO , in transporting new recruits to Basic Training when flights were cancelled because of the 9/11 terrorist attack. The government was charged for fuel and driver expenses only. In 2003, the entire Mid-west United States applicant travel system was placed in jeopardy by a breach of contract, and the carrier eventually closed its doors. At the request of the recruiting services, through TRANSCOR, Inc, Highland established 40 individual routes, six of them customized to the recruiting needs, and had them operating within 40 days. 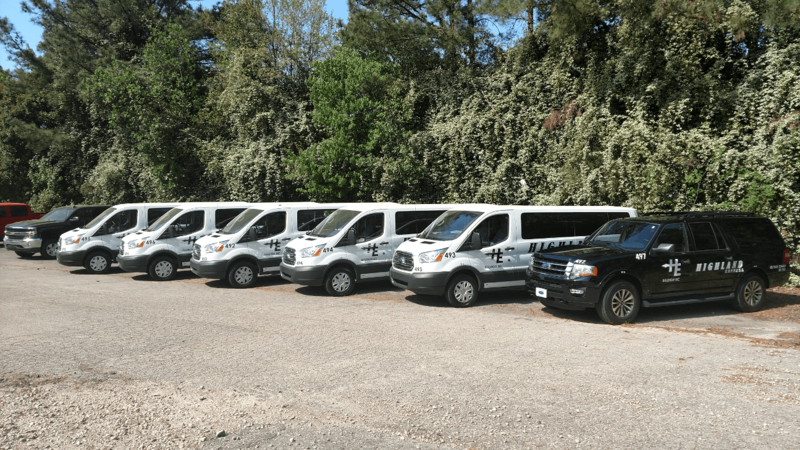 In 2005, Highland stepped in during post hurricane Katrina to assist in transporting people wherever required by the Emergency Management System. Also, new routes were established for processing the New Orleans MEPS applicants at the Shreveport MEPS. Our reputation is such, that when other carriers fail to show for contract travel, DTMO has the MEPS contact Highland to assume the travel. In 2002, TRANSCOR, Inc developed a new eticketing system totally designed to the specifications of each military service and their regulations. Operator friendly and providing total accountability, the new secure system was a breath of fresh air for financial comptrollers and the recruiters in the field. The ETRANSCOR system allows recruiters to make an online reservation for applicant travel, provides Highland drivers with an accurate daily passenger log, and alerts Highland management for the need of additional route vehicles. At any time, the military services can account for every passenger traveled and every penny spent for applicant travel. With all that said, Highland attempts to keep a competitive edge in the transportation market. As with any other service or product “Less Does Not Mean Best”.